Nothing to do. : Is There A Problem Here? : Nothing to do. 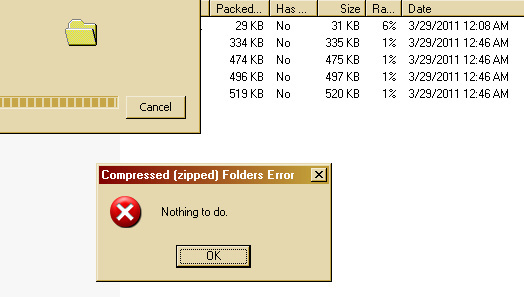 I repeatedly attempt to delete a file from within a Compressed (ZIPped) Windows XP folder. Each time I try to delete the file, Windows reports "Nothing to do." I then try to copy the file and am told there is nothing to do. After some investigation, it appears that Windows XP permits coexistence of two files with the same name but different character cases in a ZIP file, but then can't do much with them. Windows filename are not case-sensitive. It appears that filenames in a ZIP file are case sensitive. There appears to be a problem at the intersection of ZIP and Windows.